DNA Day is much more than a time to honor historical achievements - it's a day filled with opportunities for students, teachers and the public to learn how the exciting field of genome research touches all of our lives. This year, for the first time, DNA Genotek is marking DNA Day celebrations with a new program with a focus on helping students in high schools, colleges and universities learn more about DNA collection and purification. The program, titled DNA Genotek's Science Education Program, will offer Oragene/saliva self collection kits (OGR-500 or OG-500 formats) at no charge to classrooms in accredited high schools, colleges and universities for teaching purposes. Our goal is to make it as easy as possible for educators to use Oragene kits as a teaching platform in the classroom. The saliva-based collection method allows students to collect DNA and experiment with purification methods in the classroom, facilitating a greater understanding of DNA and its importance in health and disease. DNA Day celebrates the promise DNA holds in unlocking discovery that will impact global health and is the ideal time to introduce this program. We're very excited about this program and its potential to have a positive impact on science education. Accredited high schools, colleges and universities can submit an online application form to receive these kits for teaching purposes. If you want to learn more about DNA Day 2010, the best resource is the official DNA Day website at the National Human Genome Research Institute (NHGRI). There you'll find news, resources and tools having to do with genetics. 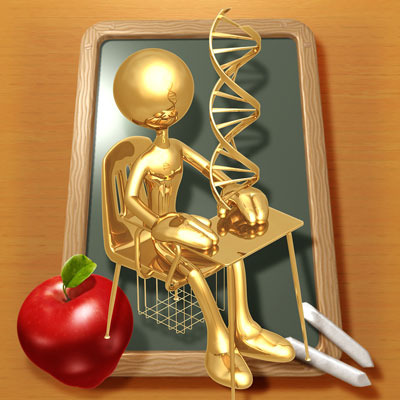 If DNA Day inspires your children (or you) to learn more about the ins and outs of the genome, let us know. We'd love to hear how this special day had an impact on you.